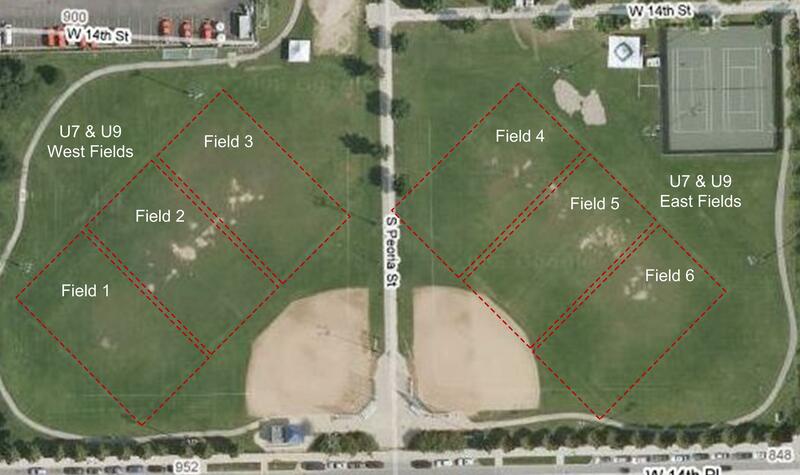 U7 play on the East and West softball fields at the South end of the UIC South Field Complex. From the South: Take Taylor Street/Roosevelt Road exit off of Interstate 90/94 (Dan Ryan Expressway) and turn left at first stoplight, which is Roosevelt Road. Cross over Interstate 90/94 (Dan Ryan Expressway), cross the next intersection (S. Union Ave.) and make a left onto S. Halstead St. Continue south on S. Halstead St. crossing W. Maxwell St. and make a right onto W. 14th Pl. The main entrance to the Park Complex is on the right side at S. Peoria St.
From the North: Take Taylor Street/Roosevelt Road exit off of Interstate 90/94 (Kennedy Expressway). Continue on S. Union Ave. and make a right onto W. Roosevelt Rd. At the next intersection, make a left onto S. Halstead St. Continue south on S. Halstead St. crossing W. Maxwell St. and make a right onto W. 14th Pl. The main entrance to the Park Complex is on the right side at S. Peoria St.
From the West: Take Racine Avenue exit off of Interstate 290 (Eisenhower Expressway). Turn right at Racine and immediately make a left onto Harrison Street. Take Harrison Street to Halsted Street and turn right. Take Halsted Street about three quarter of a mile to W. 14th Pl. At W. Make a right onto W. 14th Pl. The main entrance to the Park Complex is on the right side at S. Peoria St.
From the Downtown: Take the Ashland Avenue exit off of Interstate 290 (Eisenhower Expressway) and turn left onto Ashland. Take Ashland Avenue to Harrison Street and turn left. Take Harrison Street to Halsted Street and turn right. Take Halsted Street about three quarter of a mile to W. 14th Pl. At W. Make a right onto W. 14th Pl. The main entrance to the Park Complex is on the right side at S. Peoria St.